Hotel Attorneys: Looking for a way to significantly increase your hotel’s cash flow… NOW? Here’s one of the most overlooked approaches. “TINSTAAFL” suspended? Hotel Attorneys with a potentially critical tip for owners and lenders — instantly increasing your hotel’s cash flow. It is often overlooked. Who says “There Is No Such Thing As a Free Lunch” (“TINSTAFL”) ? Hotel attorneys know that times are tough and getting tougher. Moody’s Economy.com and PKF are now projecting a deeper and more extended downturn and a more delayed recovery. Hotel Lawyer with new data from Moody’s Economy.com and deteriorating projections for the lodging industry. and Jim Butler quote in USA today More hotels are facing foreclosure, bankruptcy. So here is a rock-solid tip that could instantly boost cash flow for savvy borrowers and lenders who qualify. This will be particularly valuable to hotels bought or built in the last 5 to 10 years . . . or maybe longer. If your property was built or bought within the last 5 to 10 years, you can recover most of the value you could have obtained at the outset, and you don’t have to amend your tax returns! Until the Tax Reform Act of 1987, almost everybody in the hospitality industry knew about the component method of depreciation, because hotels were the “poster child” for the benefits of accelerated depreciation on cash flow. It was really just a corollary of the principle that Warren Buffett loves — the present value of money or the value of compounding interest. Somehow, in the intervening years since the tax Reform Act of 1987, many people have lost sight of the continued value of cost allocation and component method of depreciation. But the boost to your cash flow can be significant. If your property was built or bought within the last 5 to 10 years, you can recover most of the value you could have obtained at the outset, and you don’t have to amend your tax returns! You just change the way you act going forward. The IRS regulation allows cost segregation studies to be conducted on properties that were put into service, acquired or remodeled from and after 1987. Although these principals and benefits apply to any kind of real property, whether hotels, resorts, timeshare, or even office or apartment houses, hotel attorney David Sudeck (who focuses on timeshare, fractionals, and private residence clubs) summarizes the basics for us in this article. While the benefits of the component method of depreciation apply to timeshare, fractional, and private residence clubs, the benefits also apply to garden-variety hotels, and other classes of real estate too. In a continuing effort to help our clients find more ways to improve their bottom line and survive the Cash Flow Crisis of 2009 (yes, we are coining a new term for this portion of the recession/depression), the hotel lawyers of the Global Hospitality Group® of JMBM recently met with Paul Olson of Commercial Cashflow Advisors (CCA) to discuss their “Cost Segregation Analysis” and other services. We have an entire tool chest and a stable of experts in our rolodex to assist our owner, developer and lender clients improve their asset values and their bottom line. We refer to our extended network of legal and advisory professionals as “Global Hospitality Advisors”. Through our SAVE® program (see https://hotellaw.jmbm.com/2008/12/save_program_solution.html), we are helping our lender and borrower clients save their assets and maximize their properties’ values. Call us for more details. 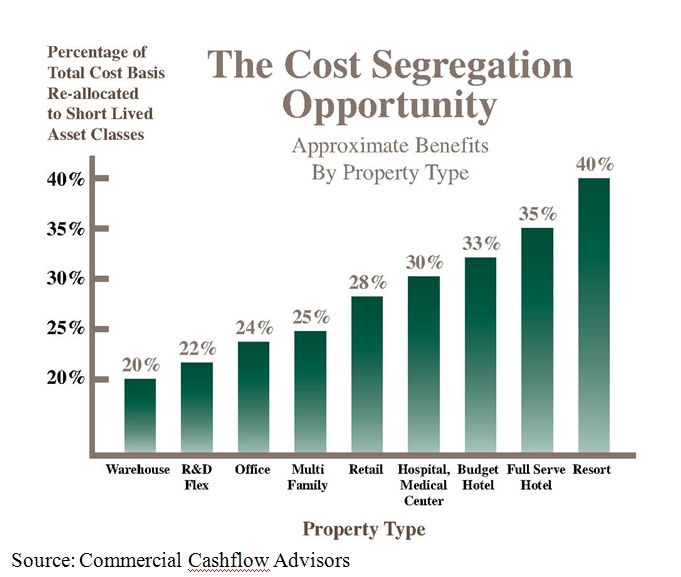 “Cost Segregation” is a powerful tax tool that can help our hotel and vacation ownership (and non-hospitality asset) owners, developers, lessors/lessees and lenders generate more cash flow. The benefits are most valuable to those properties that have been developed, acquired or leased within the past 10 to 12 years. Furthermore, conducting a cost segregation study now, even if a property was purchased years prior, does not require the taxpayer to amend prior tax returns. It is an IRS-approved accounting method that can allow hoteliers and fractional, private residence club and timeshare with an ownership interest in real and personal property to enjoy accelerated depreciation deductions when calculating federal and state income taxes. Whether the subject property was purchased, leased, built, and/or remodeled by the taxpayer, this tool may be instrumental in materially increasing cash flow by reducing tax liabilities. Although cost segregation has been available as a tool since the 1950s, many in real estate have not been taking advantage of the benefits. Now that some owners and operators are just looking to cover debt service, the extra cash may be the difference for some between keeping and losing their property. What’s this all about? The objective. Who can use it? While the benefits of the component method of depreciation to apply to timeshare, fractional, and private residence clubs, the benefits also apply to garden-variety hotels, and other classes of real estate too. The objective of cost segregation is to classify all of the component parts of a property, including hotels, motels and timeshare resorts, that can be depreciated over shorter tax lives or using accelerated methods instead of the usual 39 years by straightline amortization normally used for real property improvements. Accelerated depreciation of 5, 7 or 15 years using, for example 150% or 200% declining balance methods, may be used for certain asset types (there are eight different types). Using these timelines and methods result in greater tax deductions in the short-term. Depreciation can be used not only in connection with structural improvements such as buildings and parking garages but also tenant improvements to a property owned by a third party. It may also be available for land improvements such as signs, car ports, fences, tennis courts, putting greens, landscaping, irrigation systems, flagpoles, and even swimming pools. Needless to say, it is critically important when entering into a lease to identify whether the landlord or the tenant owns the property that may be subject to depreciation. We at JMBM can assist you by clearly documenting ownership in your lease. Either the owner/landlord or the tenant of a property should be able to enjoy accelerated depreciation for personal property. This may include property that you would not expect, such as ornamental lighting, electrical wiring, plumbing, floor covering, millwork, built-in cabinets and kitchen equipment. 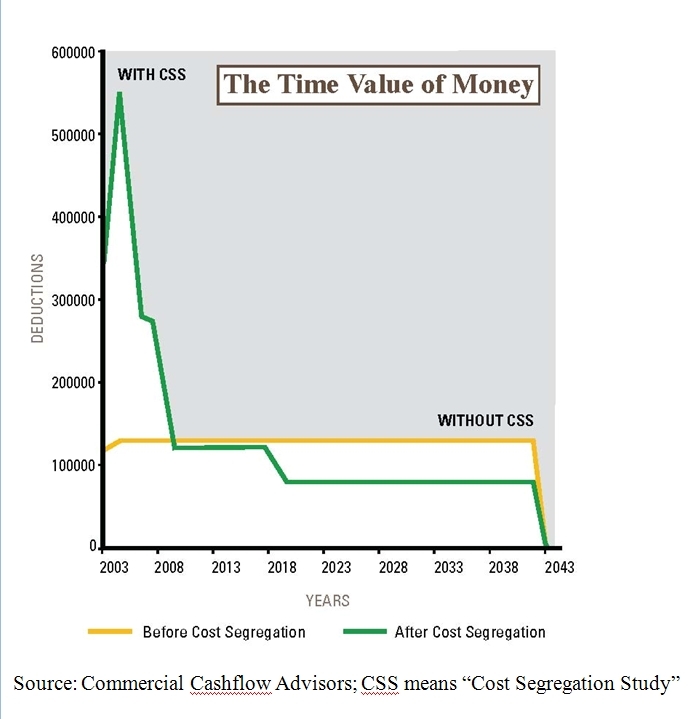 What does it take to qualify for the cost segregation benefit? The IRS requires a “quality cost segregation study”, conducted by an experienced firm. This study can enable a taxpayer to take advantage of these accelerated depreciation deductions. Upon property acquisition, most tax preparers merely adjust for land value, which is not depreciable, and then assign a 39 year life, the longest life classification, for tax deductions. In accordance with applicable code, most use straight line depreciation, the most conservative depreciation method. This results in lesser tax savings and diminished cash flow for the property owner or lessee. However, by conducting a complete property analysis (including, for example, a review of blueprints, invoices, and construction contracts, a thorough on-site inspection, and a detailed construction cost estimation), a taxpayer may enjoy the full advantage of these accelerated depreciation deductions. A well-done cost segregation study allows depreciation deductions in the first 5 years alone to increase 200-300% of the level that would otherwise be taken without such a study. Typically, for every $100,000 of cost shifted from 39-year real property to 5-year personal property classification, the net present value of the tax benefit is about $20,000. Do the math – a $1 million shift can result in a tax benefit valued at approximately $200,000. For every $100,000 shifted to 15-year land improvement classification, the net present value of the tax benefit is about $12,000. These estimates are based on a 6% ROI factor and a 43% combined tax rate. The chart below illustrates the powerful impact that the time value of money can have on a hotel owner’s investment. As the chart shows, with proper classification of the component parts of a hospitality property, the owner/lessee taxpayer may be able to successfully depreciate a majority of the property within the first five years after the classification is made. The percentage of the cost of the property that can be reclassified from real property to personal property or land improvements for accelerated depreciation varies depending on the level of finishes used in the construction of a property. For example, the percentages of reclassified costs in connection with hotels, resorts and timeshare properties can range from approximately 25% for budget properties to more than 40% for luxury properties. See the chart below for an illustration of the savings associated with certain property types. Does this benefit work on properties built or bought some time ago? The objective of cost segregation is to classify all of the component parts of a property that can be depreciated over shorter tax lives versus the usual 39 years normally used. Even if the property was not recently purchased or constructed, undertaking a cost segregation study to begin enjoying the correct property categorization now can still result in considerable tax savings. The IRS regulation allows cost segregation studies and associated property reclassifications to be implemented in connection with properties that were put into service, acquired or remodeled as long ago as 1987. However, the benefits are most valuable to those properties that have been developed, acquired or leased within the past 10 to 12 years. Furthermore, conducting a cost segregation study now, even if a property was purchased years prior, does not require the taxpayer to amend prior tax returns. Fortunately, the IRS allows a “look-back”, allowing the taxpayer to capture all of the depreciation that should have been taken in the past to be taken in the current year, even if, for example, the property was purchased 10 years prior. Generally speaking, a cost segregation study can be completed within about 90 days of the consultant’s receipt of requested agreements, blueprints, invoices and other materials. More personal property and land improvements means a more complex analysis, but it also means greater tax benefits! A proper cost segregation study will require the consultant to take detailed measurements, photographs and notes in connection with their review of a property. This allows the breakdown of a property into its various asset types, including the calculation of the replacement costs of these assets, all set forth in what is often a 100+ page report. Be sure to use an expert consultant with significant experience with the IRS to minimize the likelihood that the required asset reclassification will result in an audit. Thank you to Paul Olson of Commercial Cashflow Advisors for taking the time to meet with us and for contributing information in support of this article. Paul can be reached at 408.910.1701 or by email at olson@ccashflow.com. This article is meant to be informational for our hospitality clients and friends of JMBM’s Global Hospitality Group® and not intended to be an endorsement of Commercial Cashflow Advisors or any other specific cost segregation consultant. There are many talented service providers, and we encourage you to satisfy yourself with respect to the appropriate party to help you.